Shrimp is one of my all-time favorite foods. It's versatile, delicious, and incredibly fun to use in the kitchen. That said, if you buy fresh shrimp, you're probably used to getting them with their tail, shell, and sand vein still intact. The tail and shell are inedible, and the vein is the shrimp's digestive tract which is... gross. Trust me: you don't want to eat that. Deveining and peeling fresh shrimp may seem like a difficult task, but it's actually surprisingly easy with the right technique. All you need is a pair of kitchen shears or a paring knife, and you'll have your delicious shrimp ready to cook in no time. Hold your shrimp firmly in your hand, with the top of the shell (the shrimp's back) facing up. 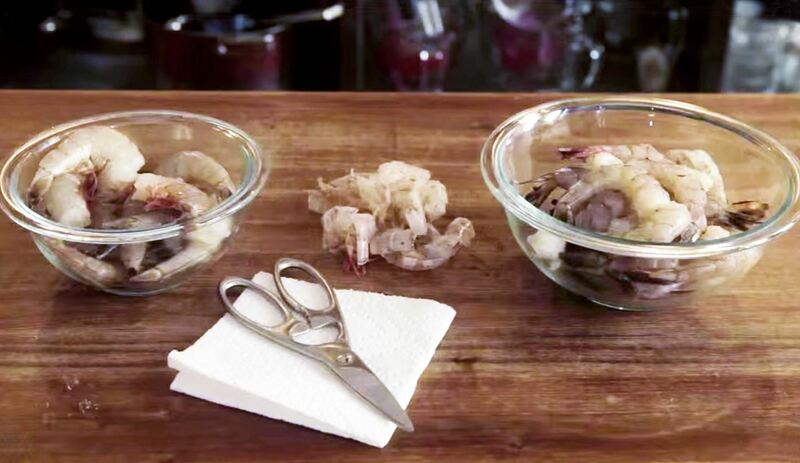 Make a shallow incision that runs from the head of the shrimp to the tail. This is safer to do with kitchen shears than with a paring knife, so please be careful if you opt for the latter! After making your cut, the shell should peel away easily from each side. Use your thumbs and peel the shell and legs as though you're removing a sticker from an apple. After you've removed the shell, the shrimp's vein will be visible along its back. 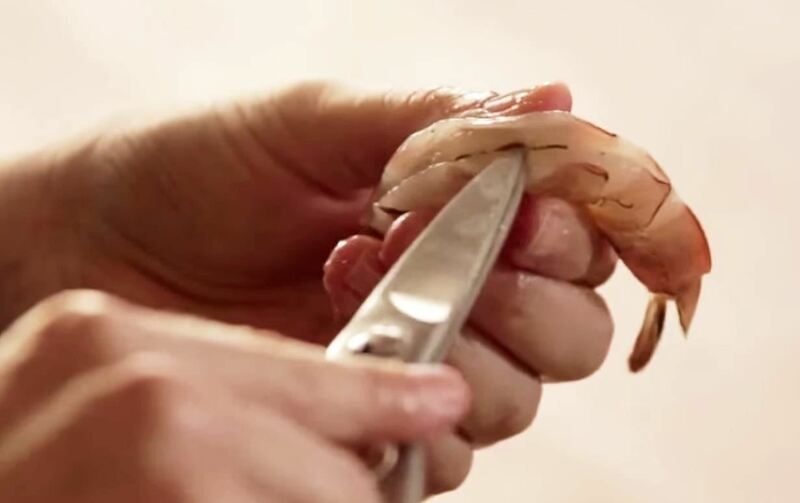 Place the tip of your kitchen shears or paring knife under the vein, in the middle of the shrimp's back. Lift your shears or knife up, and the whole vein will come right out. Wipe the vein on a paper towel (it will stick to your fingers), and you're good to go! Check out the full video from Saveur.